Oil Color: A diluted apricot wine color. Bottle Design and Artwork: This is a standard 1/32 ml imp that has been decanted for me by moons_storm. Her label features the scent notes on the back. The company acronym along with the scent’s name and the decanting information is on the front. The image on the label consists of who cartoon hearts, but the original label art is similar to below, save for the name showing the adjective in a russet version of the font pictured. ITI: Powdered milk chocolate, juicy apple, neroli, and rose remind me of a body wash I used during summer camp. What an interesting combination. Wet: The rose and apple mingle beautifully on the skin, flanked by a soft, dark powdered chocolate note, rich and nutty. Hints of teak, neroli, and patchouli swirl in as the scent warms on my skin, soon rivaling the intensity of the chocolate. I was worried that this would be too sweetly gourmand when applied, but it’s a surprising balanced scent so far. Dry: I’m getting dusky powdered chocolate, infused with musk, a hint of bergamot, and a sliver of rose 10 hours later. I’m pleasantly pleased with its staying power. Oil Color: A faintly yellow oil on my skin. ITB: I was expecting a brash symphony of notes, but instead I’m presently surprised with heavy snow and sandalwood, reminding me of Lush’s Snow Cake in the bottle. Wet: Snow notes, soft and fluffy, next to subdued sandalwood and lightly powdered amber with the ghost of ground cinnamon long past in the background yield a very interesting combination that shifts between forlorn and silent to warm, faintly spicy, and welcoming. Dry: It’s softer now that it’s had several hours to settle, drifting into the realm of faintly resinous snow with a touch of patchouli and dried cinnamon. I think I like this one better while wet, but it still is pleasant. Scent Description and Notes: “Every year at BPAL, we put up our tiny black Yule tree in the front parlor. It has red lights, and it’s decorated with whatever we have handy. I don’t remember when we got this little tree, but it’s been a Yule staple here as long as I can remember. There are always black and red candy canes on the tree; I don’t know what they actually taste like, because these things have been with us forever and are a bajillion years old. They are probably lethal by now. ITB: Fresh from the bottle, a lovely clove-dusted patchouli emerges, sweetened slightly by star anise. Ghosts of laudanum and opium fade in and out along the bottom of the scent. Wet: The labdanum is much stronger once applied to skin, although the patchouli still resonates close to the top. As it sits, the opium and musk warm, making the sweetness a little more pronounced, but not enough to overtake the strong labdanum and patchouli. The star anise swells a couple minutes after application, evoking images of infernal licorice and clove candy canes. Dry: Sweet, musky opium dusted with clove and dark patchouli and the faintest remnant of star anise remain after 8 hours. I love how long this lasts. Scent Description and Notes: “Scratched at the last minute on the advice of our legal counsel, who was afraid people might misunderstand and pour the perfume directly into their eyes. “For External Purposes Only Seaboar” just doesn’t have the same ring to it. Oil Color: The color of melting snow. ITI: I’m taking a risk with the honey note here, so my fingers are crossed that this works out. Upon opening the imp, I get the distinct impression of honeyed wine. Upon closer examination, the almost floral essence of the sandalwood, very sweet patchouli, honey, and salt are a bit more intriguing than my nose could initially appreciate. It reminds me of a sweeter, honeyed, and slightly more resinous version of Lush’s Luxury Pud (similar warm tone and roundness to the scent). Wet: Salted patchouli and honeyed, warm sandalwood dance merrily together on my skin, while the bergamot adds a delightful floral tone that seems to flit around the edges of the main notes. It’s rather pleasant, honestly. Dry: Musky, salted patchouli with the floral from the bergamot lingers on my skin several hours after application. It even has decent through of about 1″ after 4 hours. Oil Color: Light reddish oil when applied directly on my skin. ITB: Deep, dark patchouli pulsates under the dense woods while feral cinnamon slinks underneath. It reminds me of a jungle, shadowed by thick woods, soil rich and and loamy. Wet: The vetiver and cedarwood roil forth, over the patchouli, only to be pulled back into the dark earth, burning with a subtle cinnamon in its center. Dry: After 10 hours, the scent is still very much still lovely – slightly spiced patchouli warmed among gentle woods. Other Impressions: I remember bemoaning the fate that I wasn’t able to acquire a bottle of this one when I reviewed the original Umbra. I’m tickled that Beth brought it back and I’ve worn it about four times before reviewing it today. Day 1184 – BPAL’s Slay! I was debating what should come next as I have still about 11 bottles from the most recent Lupercalia update along with a whole host of older imps, but I think it’s time to review my DragCon scents! Scent Description and Notes: “The consummate host: she can fill oceans of time on the mic and still leave the crowd hypnotized. Scent Note: Bakhoor oudh generally refers to the processed incense that contains oudh and other essential oils while oudh or oud refers to the raw chips or resin from the tree itself. Oil Color: The color of sandalwood on my skin. Bottle Design and Artwork: This is a standard 5ml brown glass vial. The label features the name of the scent along the top, centered, in a bold yellow font. The company name is in the same font along the bottom. The image on the bottle is a red vampire Queen, smiling, with blood dribbling down the corner of her mouth. DragCon 2018 bottles. Image (c) courtesy of Tiah Schindelheim Rodriguez. ITB: Gorgeous earthy patchouli with some sweet tobacco over red, dark musk. It should age very well. Wet: Once again,the patchouli is the most dominant note (although much less earthy), but now I can smell the rich cocoa that twines itself around the patchouli while tobacco and resinous incense twin around the base. Dry: Wow, that is lovely once dried. The tobacco just sings on my skin next to the resinous oudh and dark patchouli while the red musk and amber sweeten deliciously. Scent Description and Notes: “I knew what the old man felt, and pitied him, although I chuckled at heart. I knew that he had been lying awake ever since the first slight noise, when he had turned in the bed. His fears had been ever since growing upon him. He had been trying to fancy them causeless, but could not. He had been saying to himself — “It is nothing but the wind in the chimney — it is only a mouse crossing the floor,” or “It is merely a cricket which has made a single chirp.” Yes, he had been trying to comfort himself with these suppositions: but he had found all in vain. All in vain; because Death, in approaching him had stalked with his black shadow before him, and enveloped the victim. And it was the mournful influence of the unperceived shadow that caused him to feel — although he neither saw nor heard — to feel the presence of my head within the room. Oil Color: It reminds me of watered down molasses. ITI: Dark resins teem with labdanum, aged patchouli, and something that reminds me of cinnamon Neccos while inky shadows pulse in the undergrowth. I’m excited to skin test this one! Wet: Oddly enough, the myrrh is much less prominent on my skin. Instead, the shadow musk and saffron drift forth, soft yet still unmistakably foreboding with the labdanum and patchouli. I like it, but I wish the myrrh was as prevalent as it was in the bottle. Dry: This is even better once dried. The scent looses much of its Necco sweetness. Instead, I’m left with a sweetened, resinous and richly beautiful myrrh note bolstered by very faint labdanum light and pleasant patchouli note in the distance. There’s just a touch of musk, but it no longer is inky and dark, but brown and fuzzy, enhancing the gorgeous myrrh note. I’d say that if you love myrrh, this is something you should try. Oil Color: A gorgeous brandied Maraschino cherry red color. Bottle Design and Artwork: This is a standard vial / imp size (1/32 oz). The label wrapped around the bottle features an Art-Deco inspired phoenix with name of the company next to the phoenix. On the other side, the title of the scent written in large, clear black font outlined with red on the front. ITI: Oh yes! Heady patchouli, deep, dark, almost astringent writhes against fiery cinnamon with touches of sandalwood to sweeten the mix. Sin indeed. Wet: Even better. The sandalwood is so much darker than I anticipated in this blend. Imagine a cabin deep in the woods, surrounded by rich soil, pulsing plant life, fragrant woods and sandalwood curling from the cabin’s hearth. Now, add dark cinnamon, corrupted but beautiful to the mix. Pardon me while I roll around in this scent. Dry: The amber is more apparent once dry, sweetining the smoldering cinnamon and patchouli notes along with the sandalwood. It’s a bit softer, but it’s still dangerous and incredbily alluring. To the wishlist you go! Scent Description and Notes: “Stretch out thy rod, and smite the dust of the land, that it may become lice, thorowout all the land of Egypt. And they did so: for Aaron stretched out his hand with his rod, and smote the dust of the earth, and it became lice, in man and in beast: all the dust of the land became lice throughout all the land of Egypt. And the Magicians did so with their enchantments to bring foorth lice, but they could not: so there were lice vpon man and vpon beast. Oil Color: The color of wheat in August. Bottle Design and Artwork: This is a standard vial / imp size (1/32 oz). 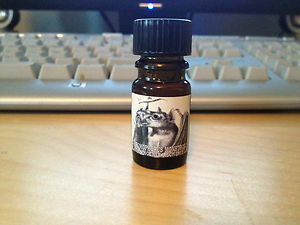 This was an imp decanted by Strangemodegirl, which features a small partial label with the name of the scent on top on a stylized font, the name of the collection bellow it in slightly larger font, which is surrounded by ankhs on either side. The title of the company is in a of the scent below the collection, and the decanting information is at the very bottom of the label. ITI: Wow, the almond is rather forceful on first sniff, although it is pleasant, milky, sweet, and honestly not all that bitter. I do pick up a slight duskiness from the frankincense, but I don’t smell much else. Wet: On my skin, the combination of almond and tonka seem to give birth to a light floral note meddled together with cinnamon and frankincense. The patchouli is strangely absent. Dry: Light cinnamon remains, but much of the almond has dissapated. I do still pick up some resin, but to me the scent loses some of it’s mystic after it dries. Oil Color: A deep mahogany color. ITI: This ‘s deliciously woodsy (a nice, full-bodied wood) with an overlay of cinnamon. It’s warm and comforting. Wet: The cinnamon is stronger on my wrist, but the cedarwood along with the patchouli are much more distinct as well. I do pick up on a little smokiness, but it is faint. Dry: It’s a lovely, round, warm, comforting scent – woodsy, slightly resinous, and spicy from the cinnamon. I wish I had more. Oil Color: – A lovely coppery oil color. Bottle Design and Artwork: This is a standard vial / imp size (1/32 oz). This is a decant from Absinthetics. On the back, she has the notes of the scent, the title of the scent in orange, the company acronym in bold, and her decanting information in green. The front is an image of a horned, smiling red goblin with a whip and scourge. ITI: It’s a resinous floral scent, very much a mature woman’s with a slightly haughty tone due to the purple musk and magnolia. I like it so far! Wet: Oh, that’s beautifully floral – magnolia, rose, gentle mimosa blossoms and a touch of patchouli make this a regal, feminine, and all around glorious scent. Dry: It’s very faint after nearly 12 hours. I can only pick up sweet red rose and magnolia, but I have to make sure my nose is right up on my wrist to detect it. Bottle Design and Artwork: This is a 5ml standard brown apothecary bottle. The label extends just under halfway around the bottom. The label is exactly as below. ITB: Oh, this is resinous and darkly enticing: patchouli, opoponax, and heady tobacco with black musky tones underneath. Wet: On my skin, the patchouli and tobacco are a bit stronger, giving me the impression of dark, inky blackness set against woods in midnight. Dry: After 12 hours, it’s tobacco and patchouli – dark, smoky, with a touch of musk. Bottle Design and Artwork: This is the standard 5ml brown apothecary bottle. The label extends just under halfway around the bottom. The label features the name of the company along with the name of the collection in tall orange block font on a black field, which frames the primary image. 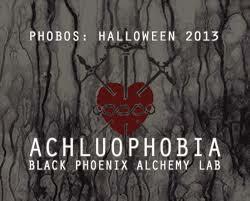 The name of the scent is right centered in tall block font along the bottom of the image, superimposed over the white background and the black alchemical sign of sulfur (which is BPAL’s symbol as well). ITB: The patchouli here is smoky and reminds me a bit of coffee. It’s much more pleasant than I had anticipated. Wet: Yes, that’s nice. It’s smoky as before, but now with a luscious earthiness. Dry: The scent is now earthy and black with a touch of resin. It’s nice and would be great layered with a rose single note. Oil Color: A peach bubblegum color. ITI: It’s a bit too sweet for me. The apple is artificial smelling and the vanilla and musk take it over the top for me. Wet: Rose apple, musk, and vanilla – it reminds me of candy. I was hoping for something more exotic, though. Dry: The sweetness has toned down some to vanilla, faint rose and apple, but I don’t get any neroli, bergamot, and patchouli, which makes me sad. Ere pain come in turn. Oil Color: An orange marmalade color. ITI: Holy patchouli, Batman! It practically leaps out of the bottle, but like Batman’s trusty partner, vanillaed amber seems to be holding on to the heels of patchouli. Wet: Warm vanilla and amber, thick and sensuous patchouli, and the warmth of honey underneath. It’s gorgeous. Dry: Now, I just get amber, vanilla, and slightly spicy honey. I just wish some of the patchouli had remained. Other Impressions: It’s certainly sensuous. In light of the Halloweenie updates, I thought I’d review a few of the Halloweenies from last year. Oil Color: This is much more resinous in color than my 2010 version. Bottle Design and Artwork: This is a standard vial / imp size (1/32 oz). This is a decant from ralenth. On the back, she has the notes of the scent in large, cursive font. On the side, she has her decanting name, while the front features the name of the collection and the name of the scent framing the image. The image is of a Celtic deity looking up at the moon, while he is framed by pumpkins. ITI: The patchouli in the 2011 is much stronger than in the 2010 – I’m sure this accounts for the darker oil color as well. The fir needles are less detectable than the previous version. Wet: The nutmeg is stronger in the 2011 version on my skin. I’m still getting a woosdy, fir scent from the 2010, but it’s just a touch “colder” than the 2011 version. Dry: Once dried, the two versions are nearly indistinguishable. Other Impressions: If you have previous years, I don’t think you would need to get this year’s version as the formulation hasn’t changed. In light of the Halloweenie updates, I thought I’d review a few of the Halloweenies from a couple years ago. Oil Color: A light motor oil color. Bottle Design and Artwork: This is a standard vial / imp size (1/32 oz). This is a decant from ralenth. On the back, she has the notes of the scent in large, cursive font. On the side, she has her decanting name, while the front features the name of the collection and the name of the scent framing the image. The image is of a bonfire under a full moon. ITI: It’s rather boozey for some reason, and I think it might be the apples paired with the mullein. There is also an astringent quality from the fir needles. Wet: Very strong, boozey notes right now on my skin, followed by allspice, patchouli, nutmeg, and a little musk. Dry: I still get mullein, allspice, nutmeg, a touch of clove, and a hint of baked apple and musk. Other Impressions: oranges, apples, a little cinnamon, and a roundness like from cinnamon. Tony wouldn’t want to smell like it as a guy, but he would like the house to smell like it. Several of the 2012 Bat’s Day scents had notes of death for me (ginger, etc). As such, this is the only one I really wanted to try. Oil Color: A rich fireweed honey color. Bottle Design and Artwork: This is a standard vial / imp size (1/32 oz). The label wrapped around the bottle is hand-created by Turtlejean. It features the name of the scent, the the decanter, and the notes on the back. The front features the artwork, then name of the scent, and the vent. Unfortunately, the imp leaked in transit so I can’t tell what the image is. In the Imp (ITI): Cocao, tonka, and a little musk. I normally don’t like foody scents, but this is pleasant. Wet: I get mahogany first, then the cacao and tonka, all bracketed by the camphor aspects of balsam. Dry: Mm, dried is lovely. I get mahogany, musk, tonka, faint cacao, and something that has a touch of myrrh. Other Impressions: Tobacco, dark cherries, and nag champa to Tony. This is another scent from the clockwork or steampunk inspired line. The imagery alone makes me hope that it works on my skin. Scent Description and Notes: “Tinkling tiny feet scuttle across a massive oak desk, navigating through a flurry of papers and a maze of discarded books, wires, and bolts. Glistening green venom beads at its chelicerae, and a ruby hourglass flashes from the creature’s underbelly as it begins to weave. Oil Color: The color of a tarnished penny. Bottle Design and Artwork: This is a standard vial / imp size (1/32 oz). The label wrapped around the bottle features an Art-Deco inspired clockwork structure with the the name of the company at the bottle of the image. On the other side, the title of the scent written in large, clear black font outlined with red on the front. The image above is the artwork reserved for the full 5ml bottles. In the Imp (ITI): Wow, the wine is so strong here, but it’s an overly sweet pinot. IT smells like raisins with a little bit of spice, but I can’t find much else. Wet: The fruity aspect of pinot noir comes out first, followed closely by patchouli and rose attar. At this point, the scent is a bit unsettling – very reminiscent of a black widow. Dry: More powdery version of the wet cent – light wine and rose, but not much else aside from that. Other Impressions: My husband claims that it smells like rose. After a month of testing scents, I have found that I gravitate toward the darker oils and Tisiphone is just that. I’m a little hesitant with the florals, but the neroli and patchouli should work well on my skin. Oil Color: A rather ruddy color. In the Imp (ITI): I get very strong patchouli with a sweet hint of oleander. On second sniff, ylang ylang makes itself known in a sweet and exotic bed of incense. Wet: Yum! There is a thick, heady scent at the beginning that reminds me of dried Debauchery. The patchouli is strong, but it’s a sophisticated one, enhanced by the intoxicating scent of neroli. As it dries, the ylang-ylang and oleander peak though, sweetening the thick incense notes. Dry: After 8.5 hours, the scent is sweet patchouli, very faint neroli, and just a hint of sweet, innocent floral. It’s rather pretty and something I would consider wearing when I want something a little floral but not grandma-floral. Other Impressions: For the Fury of revenge for familial murder, I would expect the scent’s namesake to bear notes of dragon’s blood resin and perhaps steel. However, since oleander is a highly toxic plant, and I meant highly, then the element of murder is certainly well represented.